Dissing John Edwards: A TigerHawk exclusive! Good fences do not necessarily make good neighbors. Just ask Democratic presidential aspirant John Edwards, whose huge new home just outside of Chapel Hill has been a topic of no small amusement in righty blog circles. I hope this sign frosts the Breck Girl each time he comes home. Click on the picture to get a better view of the two driveways. Edwards will start to feel like the vegetarian living next to the Hormel plant. This is just like,,,so clever! Gee, I wonder what kind of signs you can find outside of Rudy's mansion? You would have preferred an incomprehensible double entendre with an allusion to Sartre? I don't think cleverness -- at least in the sense I take you to mean -- is a major feature of presidential campaigns. Okay, I'll bite: Hell is other Democrats. 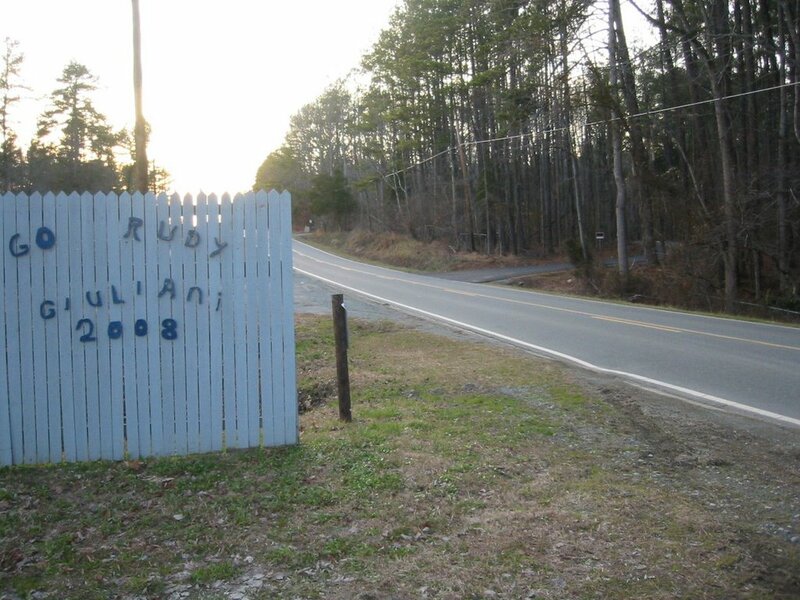 Umm, Tano, unlike Edwards, Rudy doesn't have a mansion. Just think of all the starving appalachians he could have rescued with fundage from his compound construction project! And they say that bloggers don't do original reporting??!! Interestingly enough, I just found out that Rudy Giuliani AND John Edwards are both....lawyers! Frankly, Edwards has not had nearly enough scorn and ridicule heaped upon him, based on his behavior as a "grown man". Let the ridicule begin. Edwards is NOT the son of a mill worker. He is the son of a management employee, whose employer owned and operated a mill. Jeez. "Interestingly enough, I just found out that Rudy Giuliani AND John Edwards are both....lawyers!" Seems others are beginning to catch on! Part of the legal industry! They never sell another out! Well rarely enough that it does not matter or register on the scale. This is the industry that if destroying our nation! And I do mean destroying it! This single industry Creates our laws, Argues the same laws, and finally judges the arguments as though it was some sort of college speech meet! Edwards is a leach amongst the leaches! he stole his money from all working Americans. One client at a time, he made sure he got his FIRST! Well over 100 million dollars from our health care providers! Who in turn passed on the NEW cost of doing business to us the consumer. He is nothing but a thief, and one that today is much too common. But a thief is what he is, just another con man in a suit of fine clothes you purchased for him to con you some more. I for one am rather sick and tired of having lawyers in the position of creating laws, and for sure in charge of leading this country! With tongue in cheek, I was just trying to make the point that Rudy has mostly served the public with his legal career, while John Edwards has pretty much served himself. I truly fail to see any virtue in this guy. By comparison, Hillary and Bill Clinton look like paragons of public service, judging them by a 1992 pre-presidential viewpoint. They labored in the vineyards of Arkansas politics for years. I know plenty of lawyers, good and bad. A good lawyer is worth his weight in gold to a client. It's just that PI lawyers are really the bottom of the barrel. Trusting John Edwards is akin to putting the fox in charge of guarding the henhouse. The fictional Cornell Law School professor Leonard Leech, from Vonnegut's God Bless You, Mr. Rosewater. you lose weight. It works by decreasing your appetite. weight loss for up to 2 years. by your body. Orlistat is used in the management of obesity including weight loss and weight maintenance when used with a reduced-calorie diet.